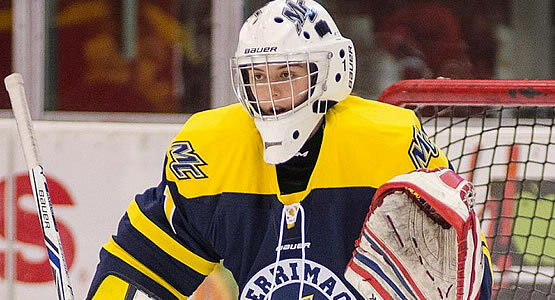 MINNEAPOLIS, Minn. - The Merrimack College women's ice hockey team upset the No. 3 Minnesota, 4-3, on Friday night from Ridder Arena in the first matchup between the two programs. Sophomore goaltender L�a-Kristine Demers (Repentigny, Quebec) stopped a career-high 54 shots, including 22 in the second period. Location: Ridder Arena | Minneapolis, Minn.
1st Period: Demers made seven saves in the first nine minutes of the first period to deny the Gophers. However, the Gophers took a 1-0 lead at the 12:11 mark on a goal by Kippin Keller. Sophomore Mikyla Grant-Mentis (Brampton, Ontario) scored her first goal of the season to knot the game at one at 14:31. Minnesota took advantage of a power play, with a goal at 19:14. The Gophers made it 3-1 16 seconds later, but the Warriors would answer with 13 seconds left in the period on a goal by junior Katelyn Rae (Courtice, Ontario). 2nd period: The Warriors were challened early, killing of a penalty in the first 2:13 of the period. Freshman Maddy Burton (Aurora, Ill.) wasted little time after, scoring 1:28 later to even the game at three. Junior captain Jessica Bonfe (Woodbury, Minn.) gave the Warriors a 4-3 lead just over five minutes into the period for the eventual game-winner, forcing a goalie change for the Gophers. Demers made 22 saves in the second to hold onto the one-goal lead. 3rd period: Merrimack had to kill off its second penalty of the game at 2:45 of the frame. The Gophers fired 18 shots in the period to Merrimack's four, but Demers stood tall in net along with the defense. - Freshman Megan Fergusson (Kitchener, Ontario) has registered a point in each of her first two collegiate games. - Rae scored her second goal of the season, while Bonfe, Burton, and Grant-Mentis picked up their first. Seven Merrimack players registered a point. - The Warriors are 2-0 for the first time in program history. The Warriors have a day off tomorrow, before returning to Ridder Arena on Sunday for the second game of the series against the Gophers. Puck drop is set for 3 p.m.